Gioachino Rossini. Very Good. In very good packaging. 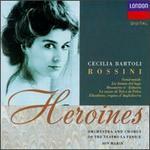 Rossini Heroines. Fine. 028943607520 1992 Decca / London retail edition. Perfect except not sealed. Ask about discounted shipping available when multiple items are purchased at the same time FAST, RELIABLE, GUARANTEED and happily SHIPPED WITHIN 1 BUSINESS DAY! Fine. 028943607520 This item is guaranteed to play perfectly with all original artwork and materials. U. Very Good. 028943607520 Item in very good condition and ready to ship-Guaranteed to play! ! Like New. Like New condition. Audio CD. Case Very Good. Booklet Very Good. BMG edition. Quality guaranteed! In original artwork/packaging unless otherwise noted.